Employees at a Darling retirement village are celebrating an awards double. 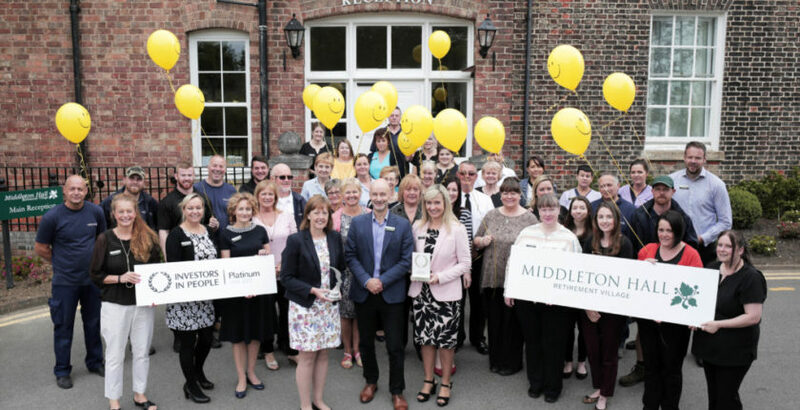 Middleton Hall Retirement Village has been awarded Investors in People Platinum (IIP) status, placing it in the top 0.5% of accredited companies worldwide. Middleton Hall has been IIP accredited since 2002, earning Gold in 2011 and now Platinum. IIP is the international standard for people management and defines what it takes to lead, support and manage people effectively to achieve sustainable results. The IIP framework provides essential skills and effective structures required to outperform in any industry and allows companies to benchmark against the best in the business on an international scale. The Platinum award follows Middleton Hall’s triumph at the Skills for Care National Award Ceremony where it was announced Best Employer of the Year. Skills for Care CEO Sharon Allen said: “My congratulations to Middleton Hall Retirement Village who came through a rigorous judging process to win a highly coveted national award recognising outstanding work on developing the skills and knowledge of its workforce.